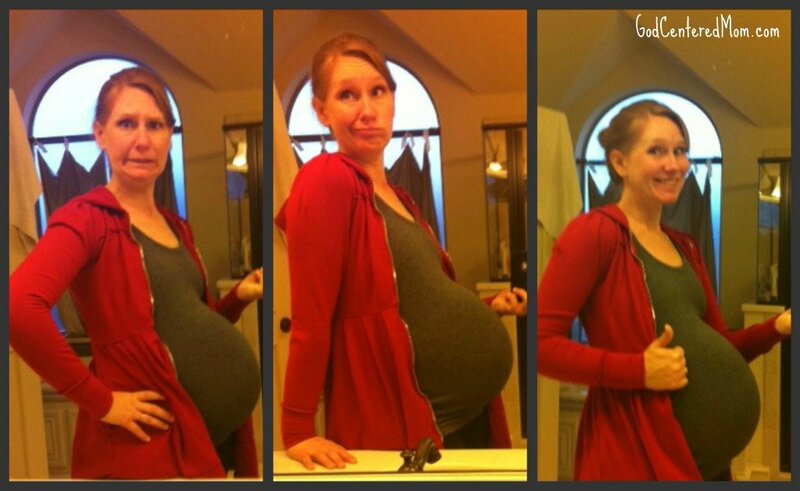 17 days until my official due date. Not that I’m counting. But am I counting down because I want this pregnancy to be over or cherishing the last days I will most likely ever be pregnant? Am I counting down the days of impatience, when these awful pregnancy hormones charge through my body, or cherishing these last memories when we have just 3 boys? Yes, I’m uncomfortable. I know I’ve hit “the end” when a trip to Target is work. When the thought of walking long distances is terrifying. Yet there is a miracle occurring in my body right now. I am experiencing an incredible phenomenon. There is an entire person, who will make people, living inside my body. Given our “family plan” this will be my last time to experience the squirmy movements. The guessing which body part just made my belly bulge. The kisses from brothers on my tightly stretched, very round belly. The anticipation of meeting this gift from God. Motherhood is full of these moments. The wanting to hurry through the challenging parts yet attempting to embrace each ounce of joy. Savoring each stage yet exhausted and ready for the next. Feeling the pressure to soak it in. To not wish it away. Things never stay the same. Life is all about movement. Moving from one stage to the next. Growing. Looking toward the future. Yet longing for memories of the past. Perhaps God designed life to be this series of transitions and dichotomies to prepare us for the struggle we have between earth & heaven? This world is not our permanent home (Hebrews 13:14). Our souls were made to be in direct communion with our Creator. Even though we belong in His presence. We can’t stand the idea of leaving this earthly home. We seek comfort & convenience. It’s anticipating the eternal joy of sitting at the foot of the throne, yet wanting to soak up each moment we have on earth. I feel like motherhood parallels our journey “home”. Just as our children slowly develop & grow out of our arms off into the world. We spiritually develop & grow out of this world into His arms. I will try to enjoy these last few moments of feeling a person move inside me. I will also hold on to the hope of what wonderful memories await me. Life is full of bittersweet developments…a constant movement toward the eternal joy in our Father’s loving presence. What transition are you experiencing right now? Do you feel the pressure to enjoy the “last days” while hopeful to move on to the next stage? I’m definitely feeling that transition now with Corinne going to kinder next year – that excitement for her, for me have some “me” time, but also the sadness that my little girl is going to school(!) and that she won’t be home with me every day anymore. She is the easiest one after all! I’m also acutely aware almost every day of the struggle between being an alien on this earth and having a citizenship in heaven – sometimes it feel like the gravity that holds me to this earth is also pulling my heart and spirit heavy to the ground. Some days it’s so hard to soar in the power of the Holy Spirit. But then I feel the pressure, like you said, not necessarily to enjoy the last days but to fully use them and this one life to further God’s kingdom and fulfill His purposes. *sigh* Too heavy for a Wednesday morning!!! 🙂 Love ya girl! May you feel the sweetness right now more than ever. Praying for you and this little boy God has planned for your family. Beautiful insight friend. Enjoy every moment. And might I just say how adorable you are? I would have never thought of thinking about it that way… but somehow it range true when I read it. Thanks for your insight…made me pause and think about my own experiences, and how they relate to my earthly home v.s. the heavenly.